Judith Cain travels the world to find inspiration for her sought-after paintings, but the place she finds most inspiring of all is right on the doorstep – her garden. Owners: Judith and Gordon Cain, both artists, live here. 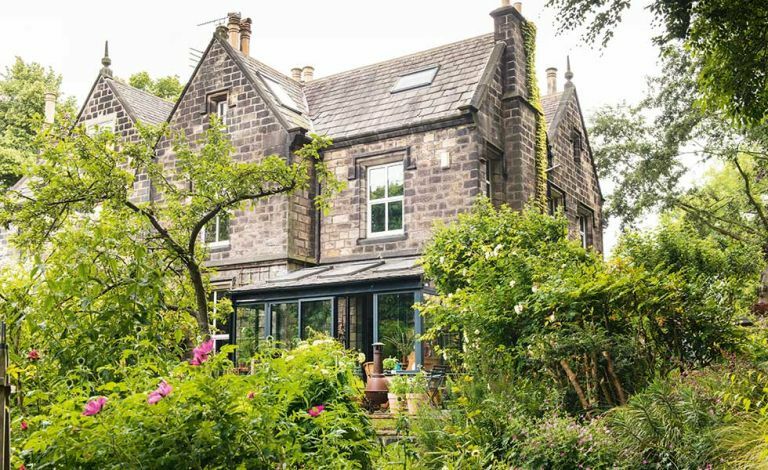 Property: A semi-detached Victorian stone house in Leeds, built in 1848. Following an attic conversion, the home is now on three storeys, with six bedrooms. What they did: The couple added a conservatory, opened up the kitchen and converted the attic to create two studios, a guest room and a storage area. The garden is so important to Judith and husband Gordon that they changed the ground floor layout of their Victorian semi to open up the views. They opened up the corridor space between the kitchen and dining rooms, installing frameless double glass doors onto the hallway to bring in more light and conserve heat from the Aga in winter. The interiors have evolved gradually with a combination of family pieces and things Judith and Gordon have bought over the years. Double doors open into the conservatory, which links the house to the garden via Express aluminium-frame bi-fold doors. Old and new sit side by side throughout the house as shown here, where an antique Chinese wedding cupboard is sited next to one of Gordon’s pictures. The entrance hall features the original stone staircase with a Victorian cast-iron balustrade, and an arch-top mirror that the couple have had for years.